Sept. 18-21, 2014, at the Trump Rink (Wollman Rink) in New York City’s Central Park. This event will feature the best equestrian sport in the world along with daily exhibitions featuring different breeds and disciplines. The Celebration of the Horse will kick off on Thursday, Sept. 18, with a $200,000 Central Park Grand Prix featuring some of the best show jumpers in the world as they vie for top prize money in this unique setting. The grand prix will be televised live on NBC Sports from 7:30-9:00 p.m., giving even greater exposure to these Olympic-level athletes. The matinees on Saturday, September 20, and Sunday, September 21 focus on young athletes developing skills and connections with their horses and ponies in diverse demonstrations of both sport and entertainment. The demonstrations are followed by world-renowned Australian horseman Guy McLean, who will perform a full half hour of his one-of-a-kind liberty act where he demonstrates his powerful connection with four unbridled horses. In this fast-paced spectacle, Shetland ponies compete in a race over miniature jumps. Maker Faire is the Greatest Show (and Tell) on Earth—a family-friendly festival of invention, creativity and resourcefulness, and a celebration of the Maker movement. Part science fair, part county fair, and part something entirely new, Maker Faire is an all-ages gathering of tech enthusiasts, crafters, educators, tinkerers, hobbyists, engineers, science clubs, authors, artists, students, and commercial exhibitors. All of these “makers” come to Maker Faire to show what they have made and to share what they have learned. In 2013 50% attend the event with children!To save money you can buy Sunday Family path valid for 5 adults per $100, children under 2 are free. 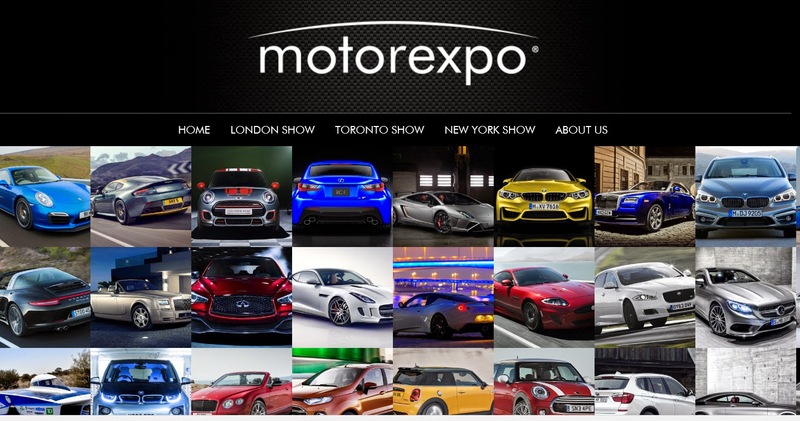 Sunday 7th -Friday 12th September 2014, Brookfield Place ( near World Financial Center) Motorexpo is the world’s biggest free-to-visit car show, with events in London, Toronto and New York. It was first run in Canary Wharf, London, in 1996, with the intention of bringing a new format to the traditional motor show. Watch your kite soar above the Manhattan skyline! 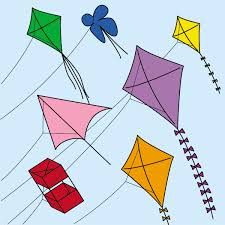 Kites will be available for purchase or you can bring your own. Pier 1 includes two large lawns, Bridge View lawn and Harbor View lawn, a playground at the northern edge with play equipment for younger children, a waterfront promenade, and a series of tree-lined pathways that provide a varied waterfront experience. 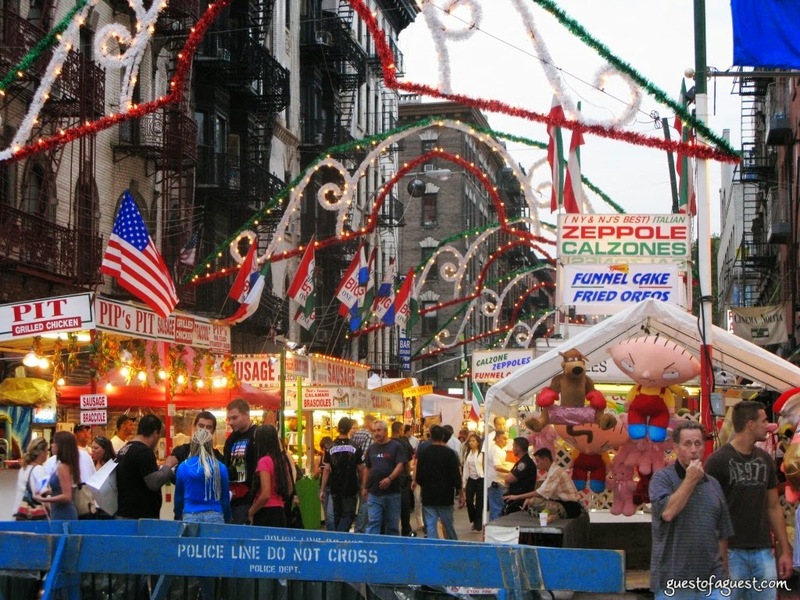 The Feast of San Gennaro is popular for its religious procession on Sept. 19, colorful parades, live music, ethnic foods, and a famous cannoli-eating contest.The festival began in 1926 and is held along Mulberry Street between Canal and Houston Streets in what is now the remaining area of Little Italy. Parish Priests will walk through the streets of the Feast blessing all the restaurants, cafes, shops and vendors so that they will all have a successful Feast. 2 PM - A colorful parade with floats, marching bands, musical entertainers and the Statue of San Gennaro through the streets of Little Italy. The festival is held in the area surrounding the world famous Cloisters, a magnificent museum of medieval art located in Fort Tryon Park near the northern end of Manhattan Island. The park offers vistas of the Hudson River and the picturesque Palisades: a setting reminiscent of Europe eight centuries ago. The Medieval Festival brings to life the customs and spirit of the Middle Ages. 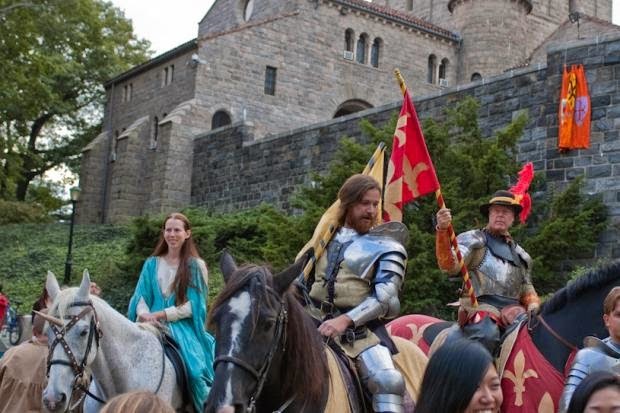 Manhattan's Fort Tryon Park is transformed into a medieval market town decorated with bright banners and processional flags. Performers, guests and festival goers dress in medieval costume. 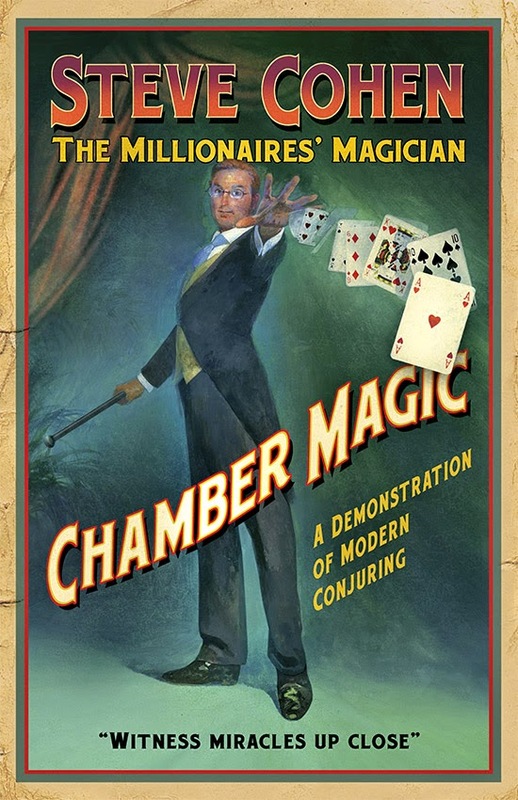 Visitors are greeted by authentic medieval music, dance, magic, and minstrels, as well as jugglers and jesters. The afternoon is concluded with a thrilling joust between four knights on horseback. Costumed vendors will be on hand to demonstrate and sell a wide variety of medieval crafts as well as food and drink. From the high platform chopines of sixteenth-century Italy to the glamorous stilettos on today’s runways and red carpets, the exhibition looks at the high-heeled shoe’s rich and varied history and its enduring place in our popular imagination. Saturdays, Sundays and holidays from 9:00 AM until 5:30PM. 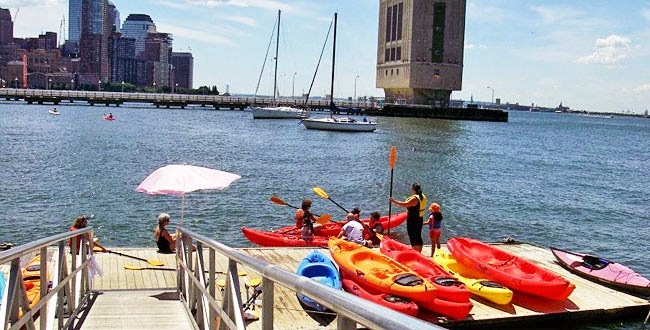 The season runs from mid May to Mid October weather permitting.The Pier 26 Boathouse and dock is the first pier south of the Holland Tunnel Ventilation Towers and is the second pier north of Battery Park City. You have to sign a waiver (good for the year) and put on a lifejacket. You can paddle for 20 minutes. Kids are allowed. 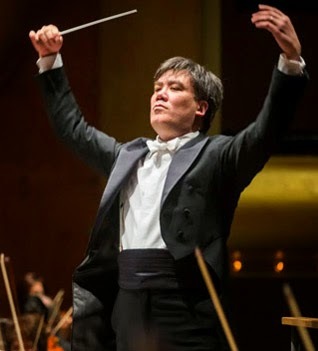 Bargemusic has presented chamber music on floating barge at the foot of the Brooklyn Bridge. 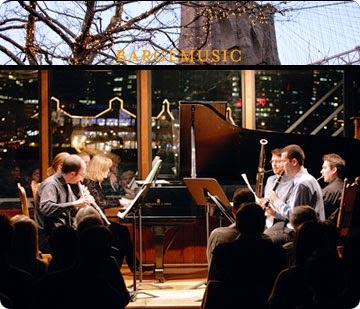 Both established and emerging musicians perform at Bargemusic on a small stage with the dramatic backdrop of the East River and lower Manhattan skyline.